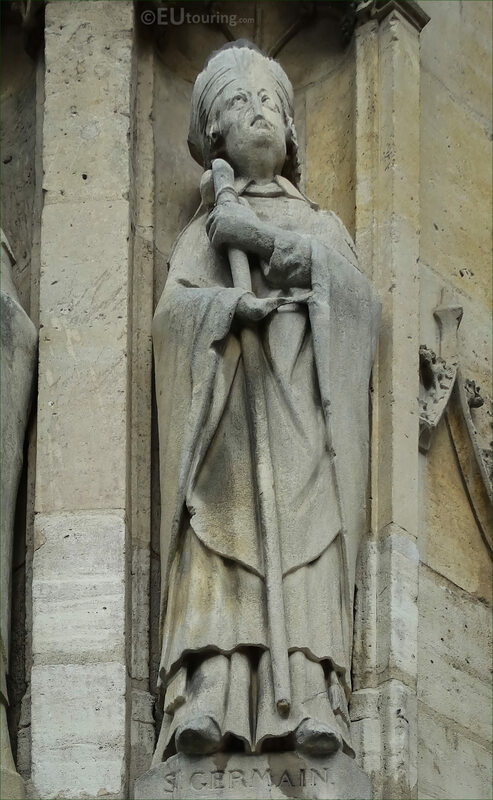 This time while we were at the Eglise Saint-Germain l'Auxerrois in the 1st Arrondissement of Paris, we took these high definition photos showing a statue depicting Saint Germain, which was sculpted by Louis Desprez. 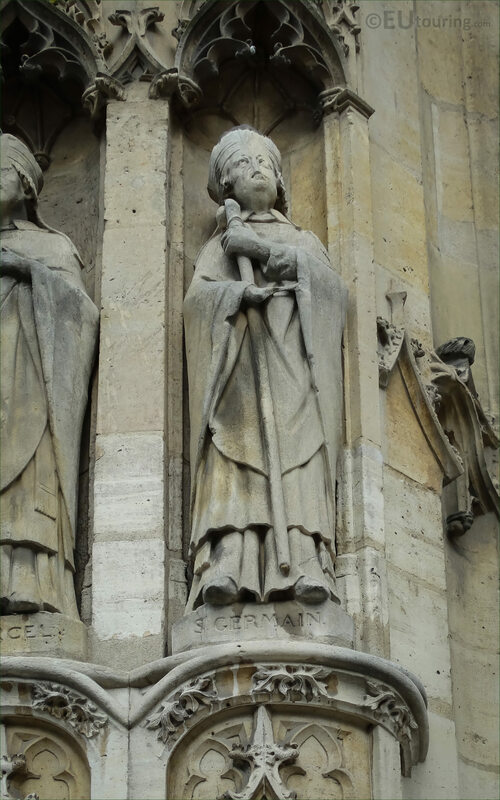 There are several statues of Saints positioned within niches of the Eglise Saint-Germain l'Auxerrois, and in this first HD photo you can see the stone statue of Saint Germain, which was sculpted between 1841 and 1842 during the major renovations that were taking place at this church in Paris. Now this and many other religious statues found on the facades or within different Catholic churches in Paris were produced by Louis Desprez who was born in 1799 and studied to become a French sculptor, winning the Prix de Rome in 1826, enabling him to further his studies at the Villa Medici French Academy in Rome. So you will find several statues of saints by Louis Desprez on the facade of the Eglise Saint-Germain l'Auxerrois, along with others on the Eglise de la Madeleine, Eglise Saint-Nicolas des Champs and the Tour Saint Jacques, but he also worked for tourist attractions such as the Palais du Louvre located opposite this historical royal Paris church. 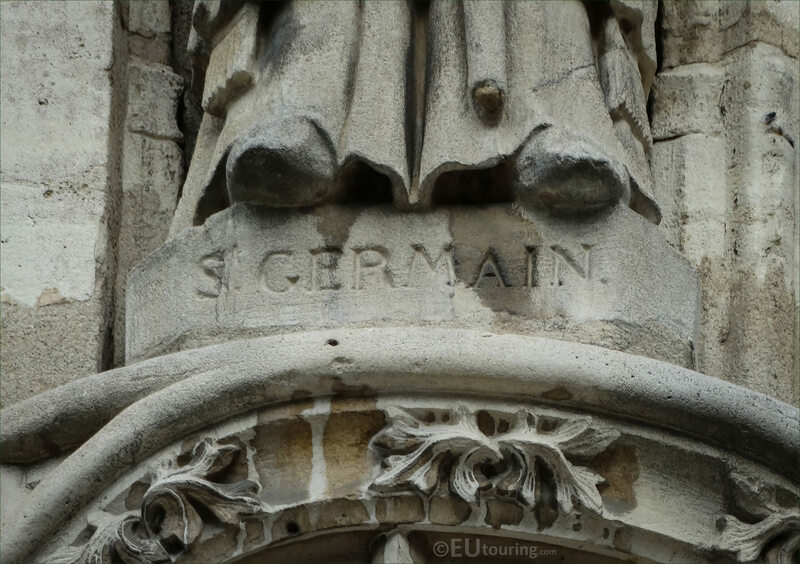 Yet in this photograph you can see the pedestal based of the statue depicting St Germain who was born around the year 496 and in Latin his name is Germanus, and becoming the Bishop of Paris because he was originally from near Autun, he is also sometimes referred to as Germain d'Autun, known in more modern times as Father of the Poor due to his immense generosity in alms giving. Germain of Paris is also another name, and passing away on 28th May 576 AD, he was canonised as Saint Germain in 754 AD, and in Roman Catholic religion his feast day is 28th May, with his relics now being held at the Eglise Saint-Germain-des-Pres, although for centuries his relics were carried through Paris in a procession at times of crisis such as famine or plague.